The Poteet girls cross country team and Aggies senior Shane Garcia repeated as District 30-4A champions and are headed to regionals next week. 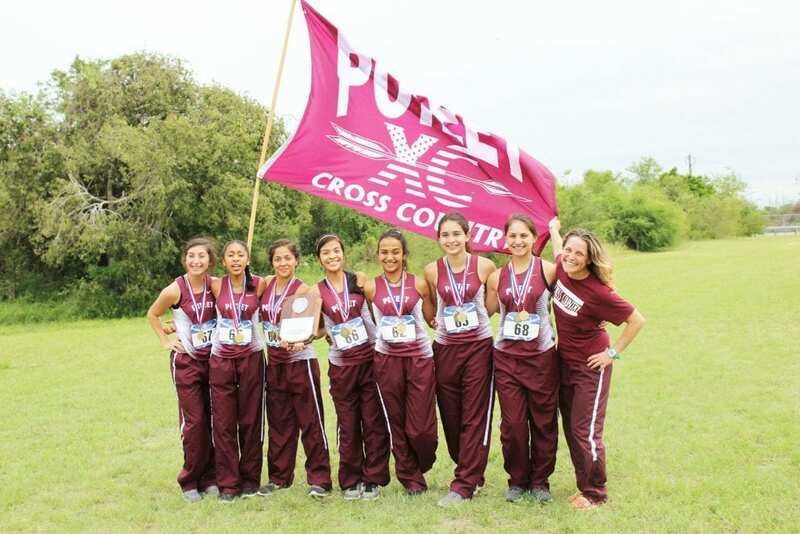 Six Lady Aggies finished in the top 10 to help defend their district crown at the meet Oct. 11 in Beeville. Poteet freshman Lauren Davila led the way in fourth place and five teammates followed in order: Bianca Haynes (fifth), Jasmine Oliva (sixth), Briana Alvarado (seventh), Alina Escamilla (eighth) and Emily Zavala (ninth). Tara Ramirez placed 12th, and Miranda Mancha also ran for Poteet as an alternate. Garcia defended his individual title and led the way for the Aggies, who finished second to qualify for the Region IV-4A meet, which will be Oct. 24 at Texas A&M-Corpus Christi. Richard Espinoza placed fourth and Aiden Panzsa was fifth. Joe Garcia (15th), Alex Ramos (24th), Noah Gonzales (25th), and Giovani Magirl (28th) rounded out the Poteet team. The Pleasanton girls are also headed to regionals. The Lady Eagles finished nine points behind Poteet in the team standings with 39. Freshman Abby Isaguirre (12:46) and sophomore Madelyn Bird (13:14) led Pleasanton with second and third place finishes, respectively. Caitlyn Nieschwitz (10th) also finished in the top 10 for the Lady Eagles, and all seven runners placed in the top 15. April Findley (11th), Ayanna Oltivero (13th), Karen Yanez (14th) and Messiah San Miguel (15th) also ran for Pleasanton. Eagles freshman Jai Oltivero finished second in the boys division and will compete at regionals. He ran a 17:17 to lead the team. Raymond Delgado (12th), David Garcia (19th), James West (23rd), James Barcomb (31st) and Jacob Mendoza (32nd) also competed for Pleasanton, which finished fourth in the team standings. In the junior varsity girls division, Pleasanton’s Natalie Contreras won the individual title. Lady Eagles Sydney Sykes (second), Claire Roane (third), Hailey Koti (fifth), Fe Vielma (sixth), Harper Brymer (seventh), Erica Santee (eighth), Emily Hilburn (ninth), Sofia Aguilar (10th), Jazmine Matos (11th), Ali Rodriguez (12th) and Adriana Clark (13th) competed as well. Jasmine Hill of Poteet placed fourth.